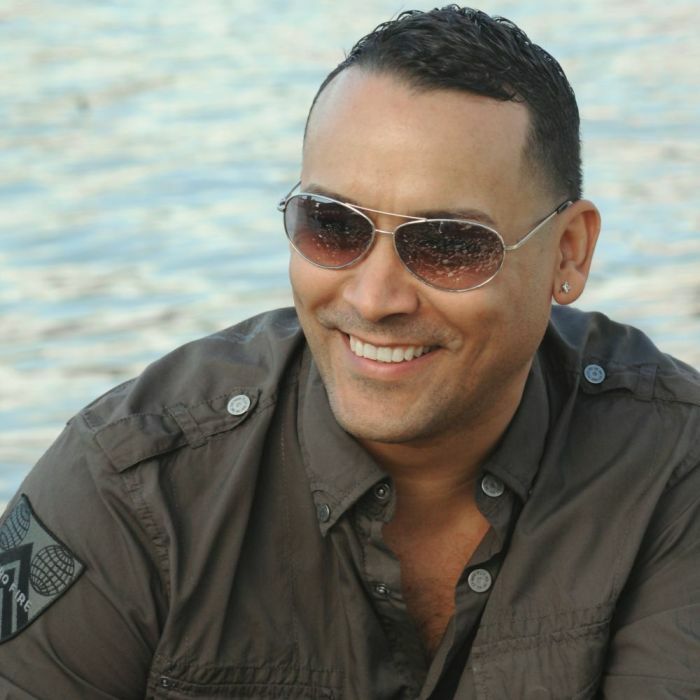 George Lamond (born George Garcia, February 25, 1967, Washington, D.C., USA), sometimes styled George LaMond, is an American freestyle music and salsa music singer. LaMond has released 7 albums (5 via Sony Music) between 1989-2014. Best known for his 1989 #25 Billboard debut, "Bad of the Heart," to his #1 Salsa smash, "Que Te Vas" (which spawned an RIAA-certified Gold album) to his more recent (2008) top 5 radio hit, "Don't Stop Believing," George's name is no stranger to the music world. Dedicated fans often refer to him as the "King of 'Freestyle'," a genre he helped define between 1988-1993. On October 24, 2014, George LaMond showcases a 25th Anniversary concert experience, backed by a 12-piece band. Not only will LaMond perform select music from his illustrious career, but he'll also debut new material for fans from his forthcoming album slated for early 2015. Lamond was born as George Garcia in Georgetown, Washington, D.C., but moved to his parent's native Puerto Rico at age 2. He remained in Puerto Rico until the age of 7, at which point the family (which included eight other siblings) returned to the contiguous U.S., settling in the Bronx, New York City, where he primarily grew up. George burst on the scene in 1989 when his debut single "Bad of the Heart" was released on indie label, Ligosa Records. 'Freestyle,' as the song was quickly labeled, was a subgenre of dance/pop music whose origins go back to the early 80s in the Latino communities of NYC. By the mid-to-late 80s, 'Freestyle' would cross over to non-Latinos with support by Anglo radio stations across the U.S. with artists such as Shannon, Expose, Lisa Lisa, The Cover Girls, and Stevie B. The sales buzz of the single,"Bad of the Heart" and George's signature vocals quickly caught the attention of Columbia Records/Sony Music, and George was signed to a major recording deal. His debut album, "Bad of the Heart," would peak at #25 on the Billboard Hot 100 but included a string of successful singles including "Without You," "Look Into My Eyes" and "No Matter What," a duet with Brenda K Starr which reached the Top 50 of Billboard. LaMond even enjoyed an opening slot on the North American leg of the 'New Kids On The Block' tour, playing stadiums throughout the U.S. In 1992, "In My Life," George's sophomore album was released, bolstered by the lead single, "Where Does That Leave Love," which quickly charted high, again. The album contained a solid mix of freestyle and pop along with a couple ballads, all intended to further build his name within mainstream music. But national pop radio, at the time, was going thru a seismic shift, with a heavy R&B influence. By the time the album's third and final single, "I Want You Back" was released (Spring, 1993), a soaring remake of the Jackson 5 classic, with backing vocals by a then-relatively unknown Marc Anthony, George would subsequently be dropped from Columbia Records. Ironically, in that same year, George released his third album (though his first Spanish-language album), "Creo En Ti" via Sony Discos, spawning two Top 15 Billboard Latin Singles, "Baby, Creo En Ti" and "No Morira (featuring Lisa Lopez)." But, label support at Sony Discos ceased once Columbia Records ended his contract. Endless touring continued well into the late 90s. Then, in 1999, while high-profile Latin music stars such as Ricky Martin and Marc Anthony engineered successful crossovers to the mainstream Anglo world, Lamond did just the opposite by returning to his roots to record Salsa music in Spanish and struck gold...RIAA-certified sales gold that is, with his 4th album, "Entrega" (Prestigio/Sony Discos). The album was bolstered by the smash lead single, "Que Te Vas", which peaked at #23 on Billboard's Hot Latin Songs chart and #6 on Billboard's Latin Tropical/Salsa Airplay chart. Also in 1999, "The Hits and More," LaMond's 5th album was released on Robbins Entertainment containing a collection of his former Anglo hits along with new material, entirely created for his loyal Freestyle fan base. The album included a special appearance by K7 as well as famed Freestyle producer, Carlos "After Dark" Berrios, along with George's long-time producer, Chris Barbosa. If that wasn't enough, George was approached by mega Platinum producer, Robert Clivilles (of C&C Music Factory fame), in late 1999, to be a part of a male group project for Sony Music Japan. Always wanting to be a part of a group, George jumped at the chance. Over the next 6 months, 'Urban Society', as the group would later be named, recorded a full-length album with George's signature vocals throughout the album. It was the first time George ever recorded a completely pop album. Due to contract issues with Sony Japan, the album's Asian release was delayed several times and the album was, unfortunately, shelved. Though disappointed, George said the recording was an incredible experience. In 2001, George released his sixth album, "GL," his sophomore Salsa album, which reached #15 on Billboard's Tropical/Salsa Albums chart. The first single, "Jurare Quererte," peaked at #20 on Billboard's Latin Tropical\Salsa Airplay chart. The follow-up single, "Volver Amar" peaked at #35 on Billboard's Latin Tropical\Salsa Airplay chart. But, the tragic events of 9-11 stifled LaMond's Salsa momentum, as it did to the entire music industry and countless others. As the Latin music business, in particular, began to recover in the mid-2000s, largely due to the rise of Reggaeton, LaMond released his 7th studio album, "Oye Mi Canto," in 2006, on Sony International. Though the Reggaeton-influenced album never achieved commercial success, it kept George relevant and maintained engagement with his fan base. And, it was because of his loyal fan base that George's touring never ceased. A simple search of 'George LaMond' on YouTube will serve up countless video clips from fans who've attended his shows. In 2008, after a hiatus from recording, a producer-friend, Giuseppe D, presented George with an idea...to release a dance-pop cover of Journey's mega hit, "Don't Stop Believing." George was emphatically against the idea to touch such a classic record. But, 'Pep' ensured him the final production would do justice...and he was right. Released on Robbins Entertainment, LaMond's cover reached #1 on New York's famed 103.5 KTU radio. The release also found success on other U.S. radio stations, especially in the Northeast and Canada. In fact, WKTU presented George with a Lifetime Achievement Award in 2009! George's dedicated fan base kept him touring. Yet, finding the right new songs proved challenging, especially as EDM (Electronic Dance Music) began to make its way to mainstream Anglo radio and Bachata music began to find reception at Latin radio, all of which reflected a younger generation. George was caught in a conundrum as he was against recording music that was not reflective of whom he is as an artist. As 2014 approached, George was presented an idea by a close friend and long-time music advisor about crafting a 25th Anniversary show with a live band. George loved the idea! The detailed planning began immediately and, now, almost a year later, the show is about to happen. The marquee lights will be shining on October 24, 2014 at Resorts World Casino NYC. Not only will George be joined by a few well-known artists/friends, along with some surprises, but he'll also debut new English and Salsa material from a forthcoming album slated for early 2015. In George's own words, "I'm fortunate to have been supported by so many in the music industry throughout my career...radio, retail, media, promoters, booking agents, and record label personnel as well as my artistic peers. But, I am most honored and humbled at the unwavering support of my fans for all these years." When not touring and performing, Lamond enjoys his home life, currently living in Staten Island with his three sons.